For use on horses and dogs. 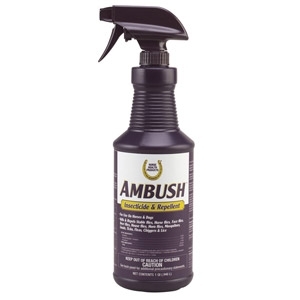 Kills and repels stable flies, horse flies, face flies, deer flies, house flies, horn flies, mosquitoes, gnats, ticks, fleas, chiggers and lice. Also controls fleas and ticks on dogs. Non-oily, insecticide repellent. Contains Pyrethrins, Piperonyl Butoxide Technical and Permethrin. Comes in a 1 qt. trigger sprayer.